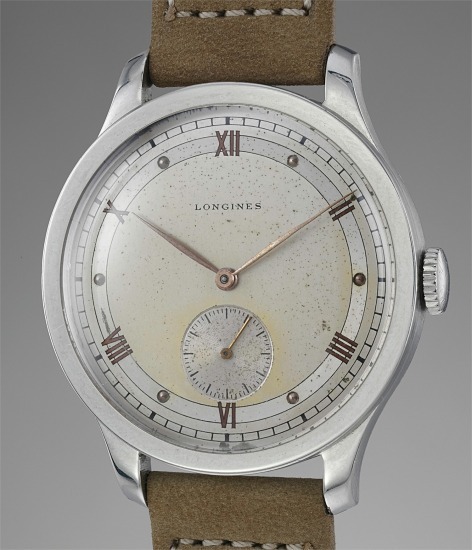 Back in the early 1940s, Longines was already ahead of time by designing wristwatches with very large diameter. Boosting a 37.5mm diameter, when men’s watches were around 33-34mm at the time, the case even looks larger due to its flat bezel. The design of the dial also enhances the case size with a very large portion left without inscriptions. The indexes are a mix between pink gold roman numerals and dots. This minimalistic design and simple "Calatrava" style case have allowed this timepiece to have passed time without looking outdated. In excellent overall condition, this piece displays a warm and charming patina on the dial that provides a visually stimulating result. Still under the radar, time only wristwatches from the 1940s with timeless designs provide a great opportunity to start a collection or a perfect watch for collectors who follow the “Less is More” philosophy. Auguste Agassiz founded Longines in 1832, and today is considered to be a pioneer in the evolution of the chronograph. During the 1930s, Longines' chronograph wristwatches were used as tools for wartime aviators and military personnel. As one of Switzerland's largest manufacturers, Longines was an important supplier of wristwatches to militaries of multiple nations. Today, they are owned by the Swatch Group and produce wristwatches for both men and women. Their vintage wristwatches continue to grow in desirability amongst collectors. Some of the most sought-after models include such oversized chronographs as the Lindbergh Hour Angle designed by Charles Lindbergh, Chronostop, Tre Tacche, A-7, Tasti a Spillo and Doppia Lanchetta.